Reinforce brand awareness by having your organization’s logo printed on your wrappers. 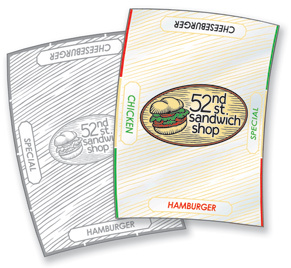 The back lamination side can even feature sandwich names and custom graphics to match up with the front. We can develop a wrapper based on your existing specifications or help you choose the best size and paper types to meet your restaurant’s requirements. Because each custom wrapper is different, please give us a call or send an e-mail detailing your requirements. We’ll provide a quote based on your specific project. Our product manager, David, will be glad to help with your next order.